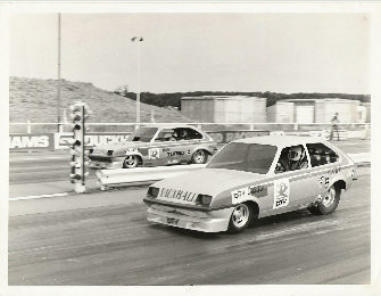 DTV Chevette’s competed in the Junior Class of Drag Racing. The Chevette Dragster consisted of a space frame chassis inside a full-size glass fibre replica Chevette Body. Junior class cars have to have recognisable production bodies. The 2.3 Single Overhead Cam engine and 4-speed gearbox provided the power and all the running gear apart from the rear axle was DTV prepared. The car completed the ¼ mile strip at Santa Pod in 12.8 seconds with a top speed of 105mph.